Donna's Crafty Place: EAD Designs Monday Blog Hop!! 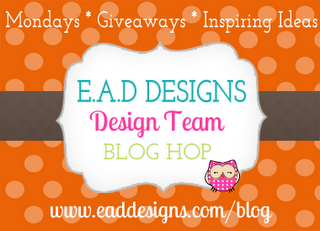 EAD Designs Monday Blog Hop!! It's Monday again so that means it's time for another EAD Designs Monday Blog Hop. I'm the Guest Designer at EAD this month and I'm having such a fun time creating cards with their stickers. One of my favorite things about them is they are completely removable/repositionable! So, if you don't get it in the right place the first time, you can lift it up carefully and try again. I love that quality because believe it or not I'm not always perfect the first time. For this card a used a fun and funky Stickerz set called Groovy. The Beetle and the Groovy both come from the set. I decide to make a very CAS design to really showcase the fun graphic design of these stickers. I added a couple of pink rhinestones to the tires just for some color and fun. Very cute! Great CAS way to highlight those stickers! Groovy, indeed! The bug is darling. very graphic card. 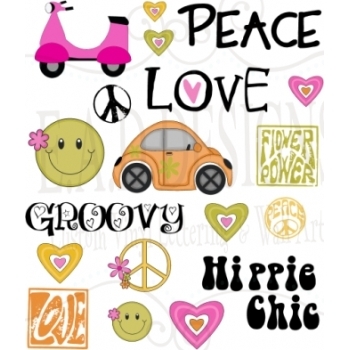 i have always oogled their stickers but never purchased, they have some really cute stuff! That is a great card! I love the Groovy! And the bug is too cute! Totally fun card! Love the retro feel and the CAS design! I love this!! So 1970's hahahaha. That takes me back to the good ole days. Fun! Thank you for sharing! just adorable! congrats on being a guest designer! This is awesome!! CAS and gorgeous! !